It was going to be a thrill driving up to the Giants Causeway and staying at a real favourite, Bushmills Inn. However, I didn’t expect the thrill I got when I hit a kerb on the M2 and ended up with a flat tyre. However, chivalry is alive and well in Northern Ireland. An extremely nice truck driver stopped and helped to put on the spare, which was a baby tyre designed to just about get you home. He then directed me to Ballymena Tyres where I was completely sorted out, even though I did have to shell out for a new tyre. I was therefore in rather a dishevelled condition when I arrived at my destination. 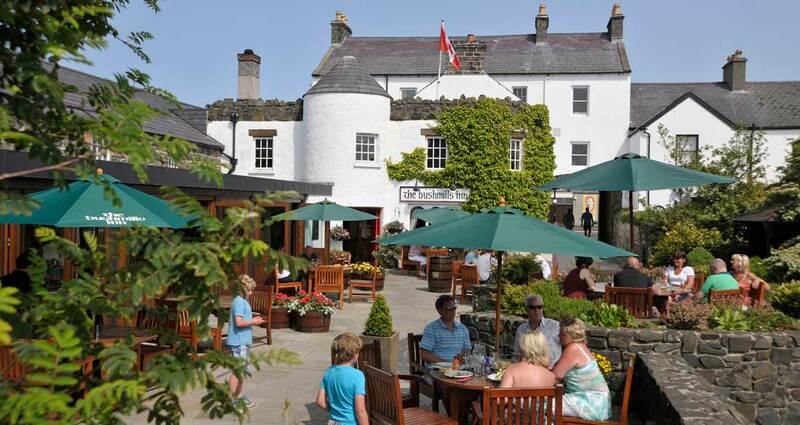 Bushmills Inn epitomises a signature boutique hotel that is so rarely found nowadays. This gorgeous hotel is full of nooks and crannies with a large section devoted to its Restaurant and Bar. In total there are 41 rooms in Bushmills Inn Hotel. The entrance to the hotel is in the middle of the building fronted by a traditional shop style porch. This is a busy establishment and the excellent signage outside deserves a mention. The main hotel lobby has a big fire (more about fires later) and very welcoming staff. Alan Dunlop owns the hotel and along with his Manager, Alan Walls, they make for a formidable team. Their attention to detail is second to none. Bedroom: The bedrooms are most appropriately named after various whiskeys (also whiskys!). My room for this visit was the Coleraine; other rooms that I noticed had very unusual whiskey names such as ‘Hand in Hand’ and ‘McKibbens Club’. Alongside the names are enchanting little photos of the original labels of the bottles. Clever or what! 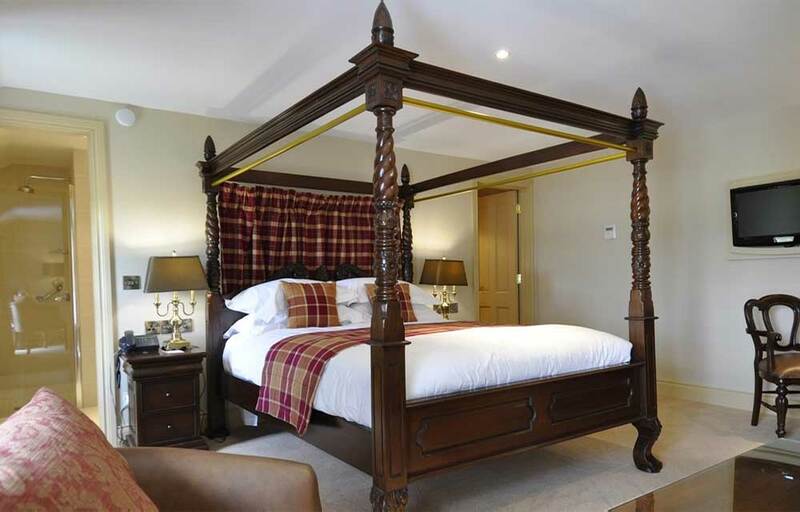 The bedrooms are of a very high standard and very spacious. Most have small dressing rooms instead of wardrobes which also contain a small fridge, safe and a quaint narrow cupboard with iron and ironing board. 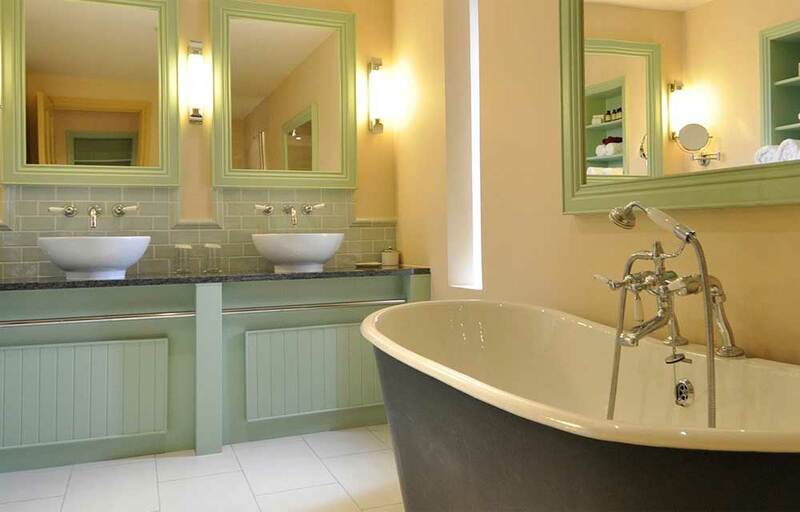 Bathrooms are equally spacious with two sinks, extra large free standing bath and walk in shower. What is really special is the separate room within the bathroom for the toilet, so often seen in continental European hotels but rarely elsewhere. Television and WIFI make these rooms very contemporary in a traditional style. Some Quirky Things to Love about Bushmills: These are in no particular order as each is noteworthy. 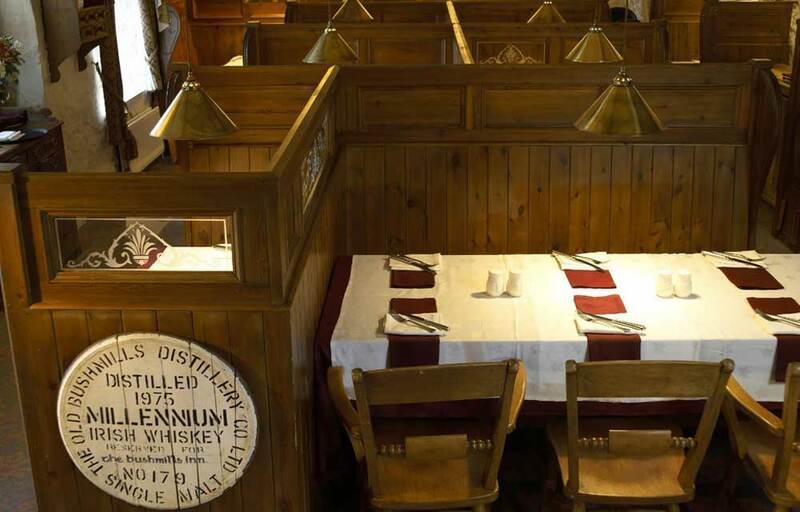 Some years ago Bushmills Inn built a tall stone Tower near the entrance, with its top floor a viewing platform and where they have a collection of 385 national flags. Every day the flag is changed to reflect the nationality of the guest who has come from the farthest distance away. Today there was a Swedish flag flying, although I gather that the American and Australian flags get quite a few outings. One can just imagine the excitement of a guest coming from some obscure far away country driving in and seeing their national flag flying high in the sky. This has to be one of the best welcomes and I gather that it is a big hit with overseas guests. Next for mention is The Gas Bar in Bushmills Inn which faces on to the main road of the village. 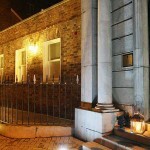 This part of the building was originally a section of the Coaching Inn dating from 1820’s. Here the original gas lighting is still in operation, which makes for a really traditional and authentic pub atmosphere. The original coach house and stables, dating from the early 1600’s now form part of the Restaurant. Film Buffs take note! Bushmills has a proper custom built 30 seater Cinema, also referred to as the Still Room. Alan had all the seating made to fit the room and most importantly each row is arranged so that the seat you are sitting in is located between the two seats in front so that you have a perfect vision of the screen (Blue Ray technology). Ssh… if you are not able to get tickets to the big rugby matches this is the place to watch some good rugby. There are five real fires where peat/loose turf and wood is burnt. Peat, for younger readers, is turf that has not been machined into briquettes. It burns more slowly, is distinctly traditional and also much more practical as it requires a bit less attention. One of these fireplaces is located in a very peculiar place upstairs; it is in a wooden structure smack in the middle of a large drawing room and referred to as the Hut. In other words a house within a house! As you can guess the Hut is a really cosy spot to sit – no draughts here – and very suitable for anyone who feels the cold. The chairs there are all very low so there is a feeling of Alice in Wonderland about this space. If you are more bookish you might prefer to retire to sit in the hidden Library. This really is a hidden room and accessed via a tiny round room through a secret door lined with books. Looking at the board room layout inside one had the feeling that summit meetings could be most successful if held in this very private space. Cuisine: The Restaurant is extensive with low ceilings and oak beams. It is broken up into various nooks and crannies: The Booths Room; the Garden Room; the Arches Room and the River Room. There is also a very attractive terrace for drinks and dinner, weather permitting! The food is terrific. I dined on a Duo of Co. Wicklow Quail, (‘lollipop’ leg and breast), followed by Greencastle Hake Fillet with cockle and mussel beurre blanc. I was glad I didn’t resist dessert which was a stunning Lemon Posset, with a fantastic zing to it. The Booth room where I sat was the perfect spot for somebody on their own – private and yet you could see and hear some of the action nearby. 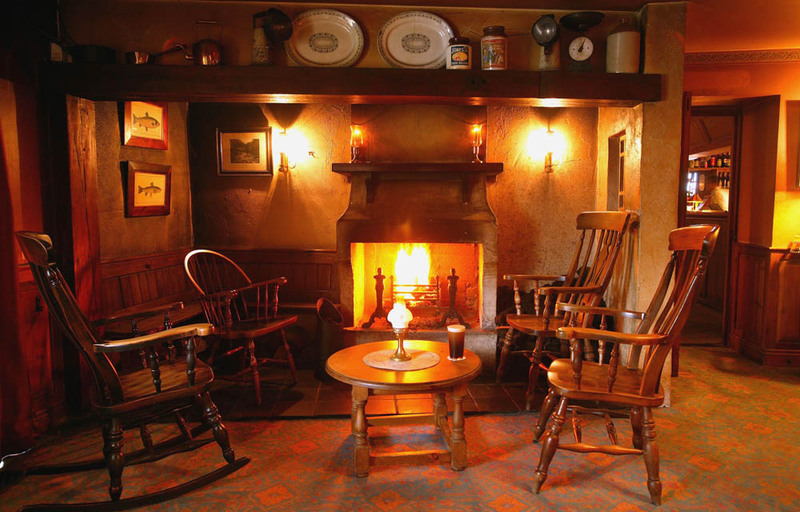 Things to Do: Bushmills Inn is located close to the famous Giant’s Causeway, a UNESCO World Heritage site which boasts dozens of legends and myths such as The Wishing Chair. Nearby is the Carrick Rope Bridge, a mesmerizing place, but only if you have a good head for heights as this scary bridge hovers and wobbles 30 metres above a chasm. If you do walk the bridge then you should follow this by a visit to the marvellous Bushmills Distillery where you can enjoy a little nip of whiskey to calm your nerves. It would also be very remiss not to mention Royal Portrush Golf Club, located just 4 miles from Bushmills Inn. It is after all No. 12 in the listing of best in the world, although anybody who has had the pleasure of playing there will put it even higher on the rankings. It has also played host to the Irish Open golf championship and attracts top golfers from across the globs. Tearing myself away the following morning I couldn’t help but notice that the flag had been changed but wasn’t able to figure out which country it was. It won’t be long before the two Alans come up with more ideas to please their guests who ‘crave the unconventional, yet still expect exceptional service’. 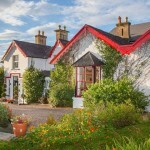 9 Dunluce Road, Bushmills, County Antrim BT57 8QG, N. Ireland.